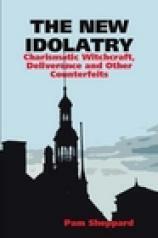 The Invisible war and THE NEW IDOLATRY! GET READY, BE READY, STAY READY! For centuries, devils and demons have disguised themselves as gods. They shared with ignorant and gullible humanity all forms of occult knowledge through mysticism. In former days, God Almighty mocked these fake gods with the 10 plagues that fell on Egypt. The gods of Egypt had different names in the days of Moses, but they are the same gods who are deceiving mankind today. These gods are fallen angels. Devils and demons have developed a much more clever deception for our generation. The Almighty’s mockery of present day gods is clearly discernible to those whose spiritual blindness has been removed. From prosperity preaching, to casting out of demons and deliverance ministry, to false prophecies, healings and miracles of charismatic witchcraft, to alien encounters, God is mocking the power and authority of religious fallen angels. Some lay hands on others to receive a blessing—a healing—but instead they receive a curse—a plague. Some respond to altar calls, yet they walk back to their seats unsaved, demon infested and tormented. With every false doctrine and demonic practice, Christians are opening themselves up to demons. Fallen angel of the occult world—-Jesus Sananda Immanuel—is now the god of the organized church. No one is immune from Sananda’s deception. ITS THE INVISIBLE WAR ITS THE NEW IDOLATRY!. THE TIME IS AT HAND! We have a private group on facebook called SEW I where we get ready for end times. If you would like to join, let us know in the comments of this post or send Pam a message at www.facebook.com/pamela.sheppard911 If you would like a SEW trained minister to mentor you, let us know in the comments of this post as well. Absolutely stunning article. I love you Pam.